FRIDAY NEWSLETTER – SPRING FLING, CHESS TOURNAMENT AND MORE! May & June are busy! Check the school calendar so you don’t miss anything! May 13 - PTA Fun Run - you can still register! It’s on, rain or shine! May 25 - PTA General Meeting, 6:30pm - Elections! May 26 - Field Day - We need volunteers - more info soon! 5K PTA FUN RUN IS TOMORROW!! You can still register! This District 15 event in Prospect Park is a way to contribute to equity and have fun! Register here. It’s a go, rain or shine! A thrilling afternoon of “scientific wonder” in the schoolyard, which means that along with inflatable rides, live music, festive food, games, crafts, and more, we’ll have a main stage science show hosted by Tiny Scientist. Sign up to help – we can’t do it without parent power! Feeling competitive? Enter our pie-baking contest! GRADES K-5, $20 per entrant. Details and signup information are here. QUESTIONS? Want to volunteer? Contact Tina March. Please attend our PTA meeting to vote in new PTA Exec Board members and new School Leadership Team (SLT) members. We hope you’ll run! Contact Nominations Chair Jane Bliss Birk. During this meeting we'll reflect on what we've developed in the past few months and strategize going forward. 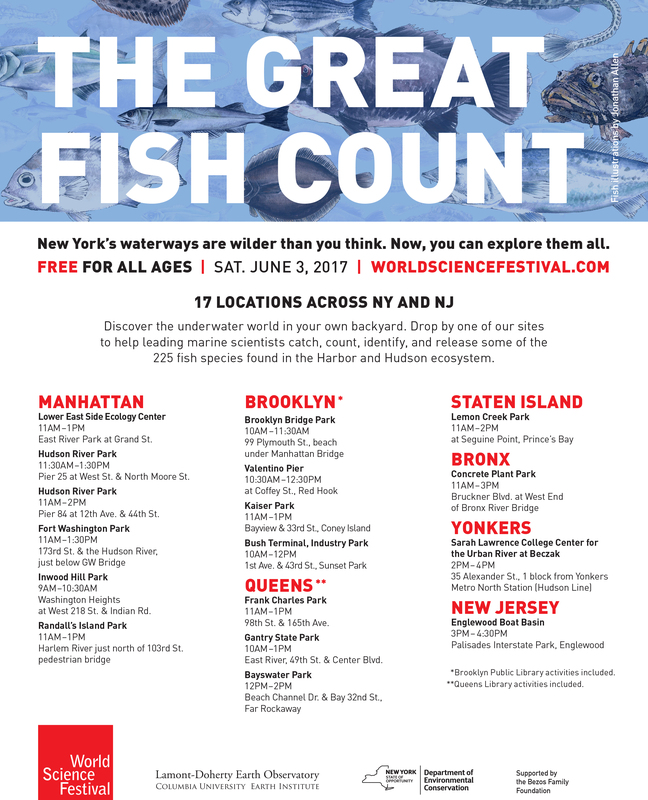 The World Science Festival is celebrating its 10th Anniversary on May 30 to June 4, 2017, and we want you to join us! 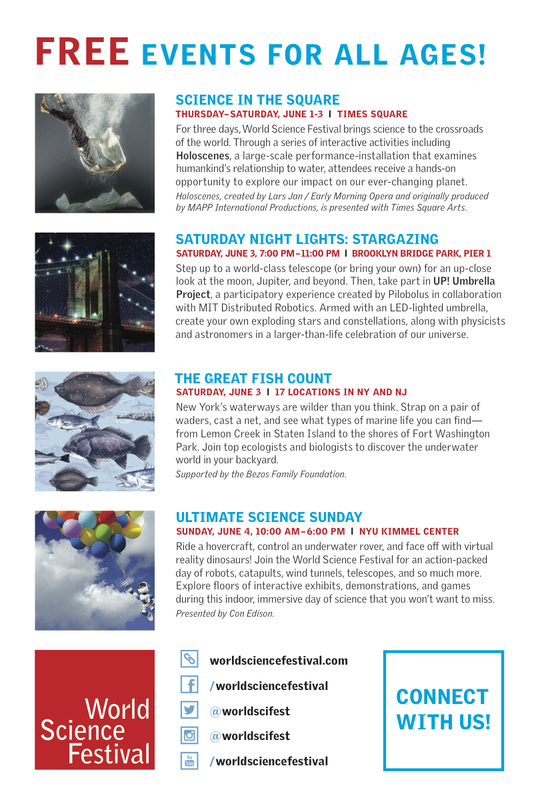 Explore New York City’s waterways, gaze at the stars in Brooklyn Bridge Park, and let your inner scientist out at our FREE Youth and Family Events. There’s something for everyone in every borough! You bring a blanket, we'll bring the fun! INCLUDEnyc invites you to our very first Outdoors for Autism. Join us June 10th at Morningside Park from 11 AM - 3 PM for an afternoon of fun, entertainment, and connection. There will be sporting events, music, arts activities, informational resources, and more. Click here to register. Hope to see you there! FRIDAY NEWSLETTER – SPRING FLING, PTA ELECTIONS, CHESS TOURNAMENT AND MORE! FRIDAY NEWSLETTER - Teacher Appreciation, Chess Tournament and more!